#Jubilee in Kisii : President Kenyatta promises goodies to Gusii land IDPs as he heckled in Ikonge. - Bana Kenya News, Real African Network Tubanane. Home featured #Jubilee in Kisii : President Kenyatta promises goodies to Gusii land IDPs as he heckled in Ikonge. 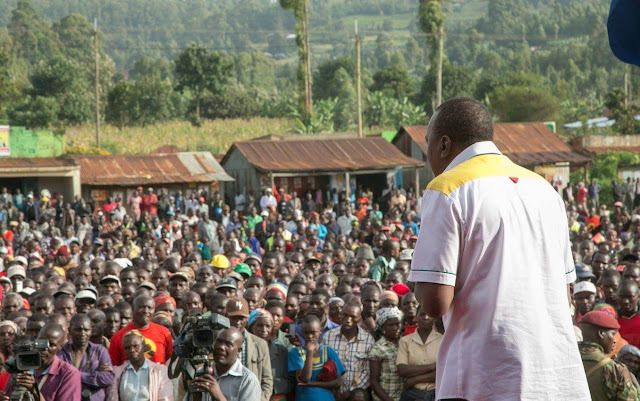 #Jubilee in Kisii : President Kenyatta promises goodies to Gusii land IDPs as he heckled in Ikonge. The Gusii IDP were given 348 Million to 7000 families which are equally to Ksh 51000 per family. According to the Jubilee critics, the Gusii people are being played in contrast with their fellow IDPs in Rift Valley and Central. "The IDPs of the other regions were given Ksh 400,000 and a plot each family. It is madness to give the IDP from Gusii land Ksh. 50,000 without land or anything. Will the cash sustain the 10 Years of suffering? On a silly IDP from Gusii land will vote for Jubilee in the coming elections. " Said Bungoma County gubernatorial aspirant Alfred Khang'ati. The people of Gusii will be expected to return their hands in the ballot box for the Jubilee come August elections. People have been criticizing the move saying four years ago the government did not recognize them, now they are looking forward to retaining their seats through small things to change people minds.